Scent Web can be up to 300% more powerful than liquid scent products, due to the amount of surface area exposure when applied. The magnum propulsion from Scent Web will shoot a web up to 15 feet, keeping the hunter’s scent contamination away from deer scrapes and trails. Because this is an aerosol, there are no messy liquids, cotton balls or containers to deal with. Each can contains up to 300 feet of web and fits easily into a coat pocket. 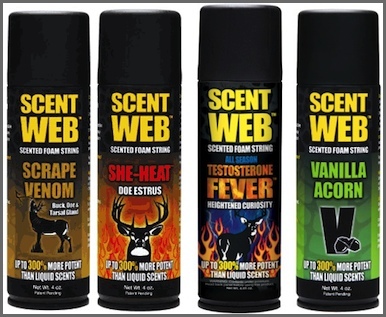 The Scent Web flavors are designed to activate with air and get stronger with time. An added bonus to Scent Web is, after it is sprayed onto a tree or made into a scent trail, it will remain active until it dries and becomes brittle. Then, once exposed to moisture, the Scent Web will reactivate and slowly dissipate itself into the ground like other liquid lures. When used over an existing scrape, this technique can aid in freshening the scrape without the hunter being present.